If you ask most people what they value most in life, often times the answer is their health. A healthy body (and mind) usually means the ability to remain active, the freedom from chronic disease and overspending on medications, energy to work in a fulfilling career, and more time spent with loved ones. Staying healthy sometimes requires an investment, whether it be a gym membership or access to healthy and natural foods. However, investing in personal health more than pays off over time, and biometric analysis tools like DXA technology can be smart to include in your health maintenance portfolio. Getting to know what lies beneath the skin can be daunting. For many, ignorance is bliss when it comes to understanding what makes up their body composition. While a number on scale may be easier to come by, it doesn’t tell how much of the body is comprised of lean, fat and bone mass. These are essential to differentiate, as percent and location of body fat can tell a more comprehensive story of health. For instance, two individuals who weigh the same on a scale can have completely different body compositions. This variance can mean the difference between the need for a full health intervention versus a recommendation for a maintenance plan. Receiving a full break-down of body composition through a DEXA scan is a smart way to gain valuable health information that other tools cannot provide. 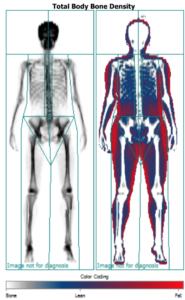 Unlike many methods of body composition testing, a DEXA scan provides significant data on regional differences in lean and fat mass. The ability to measure and compare both sides of the body is valuable in assessing potential muscle imbalances that may lead to injuries or overuse in the future. In some cases, muscle imbalances can mean structural issues in the body, which may signify the need for a specialized training program or physical therapy to prevent problems. It is often easier to take preventative measures with a known imbalance than to reverse damage caused by previously unknown issues. Typically, lean mass and fat mass are key players in any body composition test, and for good reason: they both tell a valid story of general anatomy and health. While most tests can estimate these variables, a DEXA scan provides even more information crucial to health: bone density and visceral fat. A measurement of bone mineral content shows how dense (strong) bones are, which helps assess the risk for osteoporosis. Visceral fat is the fat surrounding abdominal organs. If high, visceral fat can contribute directly to cardiovascular and heart disease, among other preventable health conditions. These two additional measurements generated from a DEXA report can show an even bigger picture of health than just lean and fat mass. When tracking progress to assess the impact of a fitness or nutrition plan, a DEXA scan report provides side-by-side comparisons from previous scans, as well as trends over time across sections of data. For instance, if your goals are to gain 5 pounds of lean mass in 3 months, taking a DEXA scan can determine if the weight you gained is, in fact, lean mass and not body fat. Conversely, for fat loss goals, a scan can show what percentage of fat was lost among the total mass lost over time. These differentiations directly show whether a nutrition and fitness plan is supporting your goal, or if any variables should be changed. Understanding what is or isn’t working takes the guesswork out of solidifying plan that is personalized to your body composition goals and metabolic profile. The amount of information from a DEXA scan can seem overwhelming, but it is extremely valuable to know exactly what your body is comprised of to not only design a plan to achieve health goals, but to gain a broader picture of health. Visually and graphically displaying data points from your own body can also bring a new level of awareness to personal health in ways that most testing methods cannot provide. Good health is one of the highest values in life, and investing to protect this value should take priority. Learn more about DXA technology!